The Mithi river is in the centre. 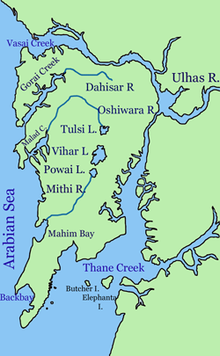 The Mithi River also known as "'Mahim River"' is a river on Salsette Island, the island of the city of Mumbai, India. It is a confluence of tail-water discharges of the Powai and Vihar lakes. The river is seasonal and rises during the monsoons. The overflowing lakes also contribute to the river flow, which is stopped by a dam at other times. During this season, the river is a favourite with anglers, who can catch large fish that have escaped from the lakes. Fishing is banned there. The international airport is located right next to the section of river at Andheri. The river originates from the overflow of Vihar Lake and also receives the overflows from the Powai Lake about 2 km later. It flows for a total of 18 km before it meets the Arabian Sea at Mahim Creek flowing through residential and industrial complexes of Powai, Saki Naka, Kurla, Kalina, Vakola, Bandra-Kurla complex, Dharavi and Mahim. The river has an average width of 5 metres in the upper reaches, has been widened to 25 m in the middle reaches and up to 70 m in the lower reaches after 26 July 2005 deluge (944 mm in 24 h on 26 July 2005). 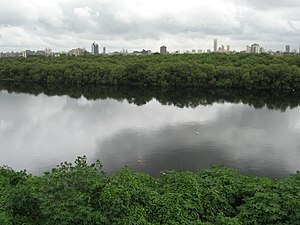 It is also less well known that the Mahim bay area, where Mithi River meets Arabian Sea is a nominated bird sanctuary where migratory birds come for nesting. This part is full of mangroves. When the river was not as polluted as it is today, it used to serve as an important storm water drain for Mumbai but as it has been used as a sewer over the years, its importance as a storm water drain has reduced and on the contrary, it poses as a hazard during high tide bringing polluted water into the city and flooding the city. The river has been polluted by dumping of raw sewage, industrial waste and municipal waste into the river. Besides this, illegal activities like washing vessels, animals and oily drums, discharge of unauthorised hazardous waste are also carried out along the course of this river. Cattle sheds in some areas contribute animal waste. Barrel cleaners, scrap dealers and others dump sludge oil, effluent and garbage in the river. The organic waste, sludge and garbage dumping has reduced the carrying capacity of the river. The water with mixture of sewage and industrial waste is a threat to marine life. The river bed is full of sludge, garbage and vegetation growth like water hyacinth in many parts. The city of Mumbai earned the epithet – 'Cottonopolis of India' due to its vibrant cotton textile mills. The mills over the years have utilized water from this river and dumped their waste into it leading to the present polluted state of the river. The Municipal Corporation of Greater Mumbai has undertaken a cleanliness drive lately so that the floods of 26 July 2005 are not repeated. An environmental group has been formed by Rajendra Singh, an award-winning conservationist in 2009. The BMC has been able to remove just 267,000 cubic metres so far, or 60% of what is required. It aims to revive the dying river. Many young entrepreneurs in and around Mumbai are now aggressively involved with rasing awareness of the degradation of the Mithi River, and creating awareness on a global scale as the government of India has again began to ignore this extremely important issue. In 2009, environmentalist and Magsaysay Award winner, Rajendra Singh lead a yatra, of a group of environmentalist and NGOs, through Mumbai city along the degraded Mithi river to highlight its problems. ^ "Mithi river water pollution and recommendations for its control" (PDF). Maharashtra Pollution Control Board. Retrieved 29 August 2014. ^ Aghor, Ashwin (12 January 2009). "Eco group formed to revive Mithi River". DNA. Retrieved 21 June 2009. ^ "Waterman of India plans a river parliament to revive the Mithi". Indian Express. 12 January 2009. Archived from the original on 6 September 2012. ^ "Water babies, stinky but timely". The Times Of India. 28 June 2009. Five Disasters Waiting to Happen, a film that chronicles the Mithi river's ecological issues. This page was last edited on 27 December 2018, at 18:17 (UTC).